We all know it's good to exfoliate the skin on our face, but did you ever think about your scalp? The Wonderful Scalp Exfoliator by Madam CJ Walker addresses just that. It's a treatment that removes buildup to reveal a smoother, healthier scalp. And you know what that means... healthier hair! Whether you are filling your summer days with outdoor activities or filling your hair with multiple styling products, your scalp can always benefit from exfoliation. Everything from sweat, dirt, and product build-up can affect your scalp's condition and your scalp needs more than typical shampoo and conditioner. 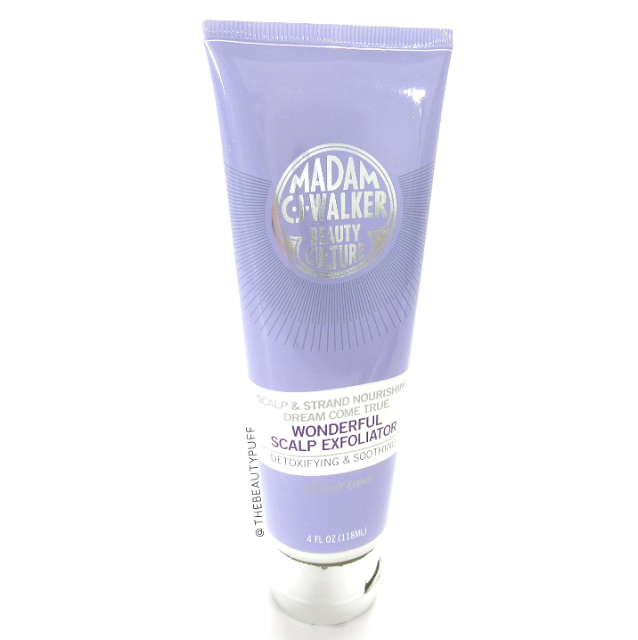 The Wonderful Scalp Exfoliator works deep down to detoxify the scalp and maintain balance. I never thought of treating my scalp before, but did you know that your scalp has more oil glands than your cheeks, forehead and nose combined? Yuck. As someone with oily skin, I can only imagine... so I was definitely intrigued by a product that would help alleviate excess oil! How to | Prior to shampooing, massage the exfoliator into your scalp and let sit for about 12 minutes. Follow by rinsing thoroughly and shampoo and condition as usual. I love how clean and soothed my scalp felt after using this exfoliator. I use a lot of products to tame frizz and keep my wavy hair under control this time of year, so my scalp definitely needed some attention. As a bonus, it smells like vanilla, one of my favorite scents! If your hair has been rather lack-luster, typical hair products might not be the solution. Taking care of your scalp results in healthier, more luxurious hair. So start at the source and add a scalp treatment to your haircare routine. You can find Madam CJ Walker products on Sephora's website below!